Tsukasa and Nasa take the train from Kyoto to Nara, where they then take a taxi to the home of Nasa’s parents. Nasa explains that his father is a former archeology professor at a large Tokyo university. He and Nasa’s mom moved to Nara so he could do archeology work in that historic city. The couple arrive at Nasa’s parent’s home, where Tsukasa notes it is next to the Kasuga Taisha (grand shrine). She also notes how the mountains have not changed in 1000 years. Since Nasa’s parents are more nervous than the newlywed couple are, Nasa has to prep them a bit before introducing Tsukasa. Nasa’s mother, Kanoka, nervously rushes away to make tea after greeting Tsukasa. They find Nasa’s father, Enishi, sitting nervously at the table. During the traditional greeting exchange part of the visit, Enishi suggests that Nasa take a bath. Nasa doesn’t want to and protests when Kanoka drags him off. Since Enishi desperately wants to have a private word with Tsukasa, she tells Nasa to take a bath. With Nasa gone, Tsukasa is stunned when Enishi performing a dogeza bow to her. He earnestly thanks Tsukasa for saving Nasa’s life since he’s an only child. Enishi acknowledges that he and Kanoka are social misfits and tactless, but Nasa is their pride and joy, whom they somehow managed to raise to be a good kid. As such, Enishi pronounces his sincere blessing on Nasa and Tsukasa’s marriage. In response, Tsukasa thanks him for his kind words and performs a senrei bow from the seiza sitting position. Since Tonikaku Cawaii chapter 27 started the next phase of the “Honeymoon Arc,” I decided to start here for my new chapter reviews. 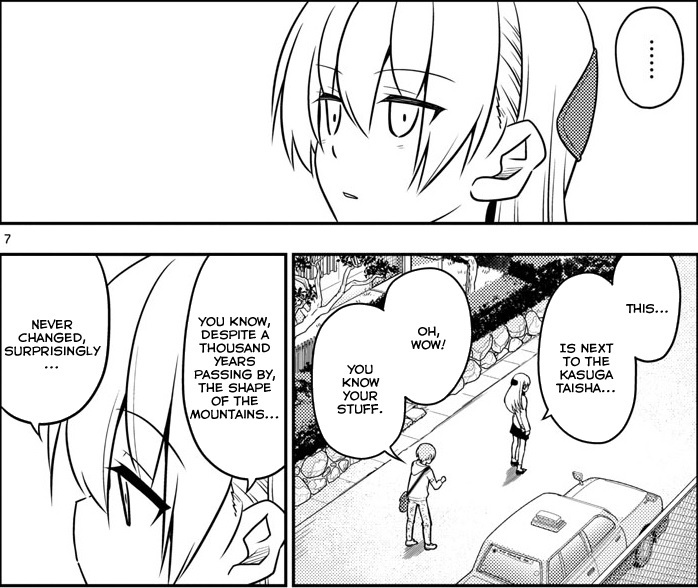 And I must say, Tonikaku Cawaii chapter 27 is a lovely chapter indeed. What made me tear up a bit was Enishi’s dogeza bow and his heartfelt words of thanks and gratitude to Tsukasa for saving Nasa’s life. It amazed me how much emotion came through the pages here. And naturally, he’s going to give his blessing to the marriage and welcome her to the family. It is times like this where Japanese tradition with bows and such really helps make a moment. As I stated in my “first look” review of Tonikaku Cawaii, Hata-sensei has been dropping major hints that Tsukasa is immortal and may in fact be Kaguya-hime from The Tale of the Bamboo Cutter story. 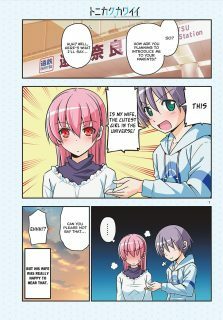 We again see these immortality hints in Tonikaku Cawaii chapter 27. When Tsukasa and Nasa arrived at his parent’s home, Tsukasa immediately noticed that they were next to (or rather quite near) the Kasuga Taisha. Other than her possibly having some connection to this shrine, it was her words about the mountains not changing appearance in a thousand years that cause the ears to perk up. It is as if she saw these mountains and the Kasuga Taisha 1000 years ago. 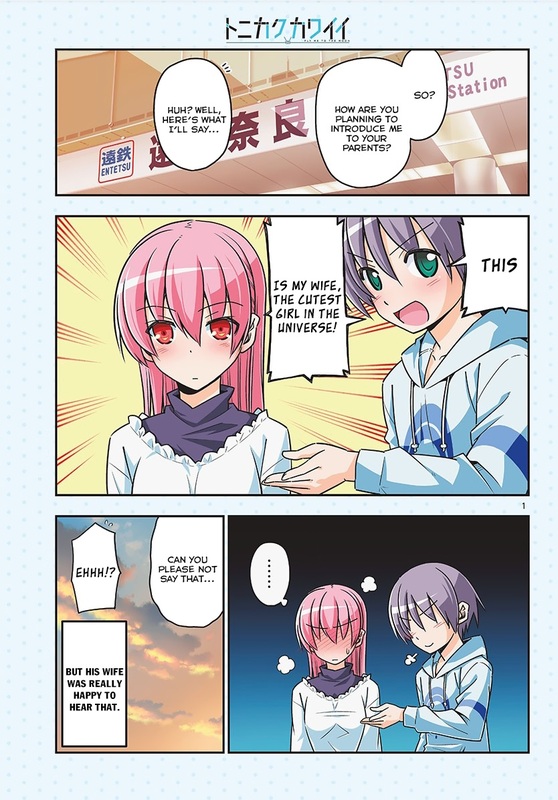 In the end, Tonikaku Cawaii chapter 27 is a sweet chapter, in which we get to see Tsukasa welcomed into Nasa’s family.